LONDON, Dec. 22, 2016 /PRNewswire/ -- Hertz Global (NYSE: HTZ) has become the exclusive car rental service provider of Hong Kong-based international carrier Cathay Pacific, following the signing of a two-year agreement between the companies. As part of the agreement, the car rental company has launched a specifically-created Hertz, Dollar and Thrifty website to provide Cathay Pacific's passengers with convenient access to a broad range of vehicles and offers at around 10,000 locations globally. In addition Cathay Pacific passengers will now receive an automatic 5% discount on Hertz Rent a Car basic car rental globally. "Becoming the exclusive car rental service provider of Cathay Pacific is a significant milestone in our longstanding partnership with the airline," said Eoin MacNeill, Vice President, Hertz Asia Pacific. "The new, exclusive multibrand website we have launched for Cathay Pacific's passengers will enable them to find the car rental service that best suits their needs in just a few clicks. It is an honour for us to continue to grow our relationship with such a prominent carrier, which, like us, is strongly committed to excellence in customer service. We are looking forward to continuing to offer Asia Miles members exclusive benefits and to serve all Cathay Pacific passengers looking for convenience and reliable options when renting a car." Roberto Abbondio, Managing Director, Cathay Pacific Holidays, said: "At Cathay Pacific, we care about our passengers' experience at every stage of their journey – from the moment they visit our website to make their booking, until they reach their destination and beyond – and our exciting new partnership with Hertz Global underlines our commitment to a 'Life Well Travelled.' Providing our customers with more choice and convenience beyond our award-winning flying experience is very important to us and we are delighted to be teaming up with Hertz Global, a company that has built a well-earned reputation for world-class customer service." To celebrate the new agreement, Hertz Global has launched time-limited discounts of up to 20% on basic car rental for Cathay Pacific's passengers renting with Hertz at participating locations in the U.S, Canada, Europe, Australia, New Zealand and Asia. In order to benefit from the promotion, passengers need to book their Hertz vehicle before January 31, 2017 and collect it between January 1, 2017 and March 31, 2017. In addition, members of Asia Miles, Cathay Pacific's frequent flyer program, will also earn up to 2,000 extra miles for every qualifying rental. Specific terms and conditions apply*. This new agreement is the extension of the longstanding partnership between Hertz and Cathay Pacific's frequent flyer program Asia Miles. 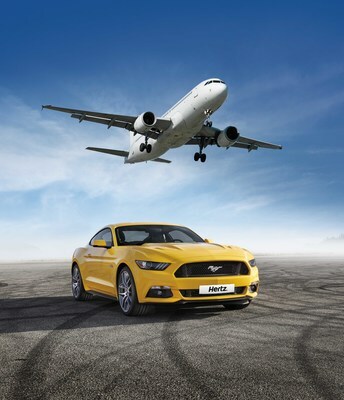 Members of Asia Miles will continue to earn up to 500 Asia Miles and receive a 10% discount on basic car rental when renting with Hertz. Additionally, on top of enjoying a 10% discount and Asia Miles earning capabilities when renting with Hertz, Green and Silver members of the airline's Marco Polo Club will receive a complimentary one car class upgrade. Marco Polo Club Gold and Diamond members will be also entitled to the 10% discount off the basic car rental price on vehicles from Hertz's Prestige and Fun Collections, and to a two car class upgrade at no extra cost, subject to availability. Specific terms and conditions apply**. Offers are valid on the Hertz Rent a Car brand only. Offers are valid on leisure retail rates for bookings made online at http://www.hertzmultibrand.com/cathaypacific/specialoffers.aspx from now until 31 January 2017 for pickups at participating locations from 1 January to 31 March 2017. Participating locations in Europe: Belgium, France, Germany, Italy, Luxembourg, Netherlands, Spain Mainland and UK. Participating locations in Asia: Brunei, Hong Kong, Korea, Malaysia, Pakistan, Philippines, Singapore and Thailand. Reservations must be made at least 24 hours prior to reservation pick-up time (48 hours for rentals in Asia). Offers are subject to a minimum 3 days rental. Offers are valid on all car groups in USA, Canada and Asia; compact and larger car groups in Europe; and intermediate and larger car groups in Australia and New Zealand. The discount applies to time and mileage charges only and does not apply to taxes, fees, surcharges and optional services. Offers are not applicable to tour/pre-paid, travel industry, staff or any other special rates. Offers cannot be used in conjunction with any other offers, discounts or promotions. Standard blackout dates may apply. Asia Miles will be credited to the member/s account 6 to 8 weeks after the completion of each rental. All rentals are subject to Hertz standard rental terms and conditions. Hertz reserves the right to change or remove this promotion at any time. Hertz Global operates the Hertz, Dollar and Thrifty vehicle rental brands, through its operating company The Hertz Corporation, in approximately 10,000 corporate and franchisee locations throughout North America, Europe, Latin America, Africa, the Middle East, Asia, Australia and New Zealand. Hertz Global is one of the largest worldwide airport general use vehicle rental companies, and the Hertz brand is one of the most recognized in the world. Product and service initiatives such as Hertz Gold Plus Rewards, Carfirmations, Mobile Wi-Fi and unique vehicles offered through the Adrenaline, Dream, Green and Prestige Collections set Hertz Global apart from the competition. Additionally, Hertz Global owns the vehicle leasing and fleet management leader Donlen Corporation, operates the Hertz 24/7 hourly vehicle rental business in international markets and sells vehicles through its Rent2Buy program. For more information about Hertz Global, visit: www.hertz.com. Cathay Pacific Airways is a Hong Kong-based international airline offering scheduled passenger and cargo services to some 200 destinations worldwide, with a fleet of around 140 wide-body aircraft. The airline continually invests in its products and services, both on the ground and in the air to help its passengers travel well. Cathay Pacific has also made substantial investments to develop Hong Kong as one of the world's leading global transportation hubs. The airline is a founder member of the oneworld global alliance.